Anthony Van Leeuwenhoek’s first microscope, from the seventeenth century, looks nothing like a modern SPIM microscope, but both are products of a quest to improve optics. Stegerphoto. From pre-classical times onwards, it could be argued, lens-makers have been the unsung heroes of science. As early as 750 BCE the Assyrians were shaping lenses from quartz. From there, the history of optics both underpins and enables discovery in both the macro and micro worlds. Where would science be today had it not been for the patient work of myriad lens grinders and optics theorists, including Francis Bacon, Galileo, van Leeuwenhoek, right up to Roberts and Young – inventors in 1951 of photon scanning microscopy – and beyond? Even today, the quest for better, clearer, more detailed images from lenses continues apace, with the latest advance, declared in the journal Nature Communications, coming from the US National Institutes of Health and the University of Chicago. A team of researchers, led by Hari Shroff, head of the National Institute of Biomedical Imaging and Bioengineering’s lab section on High Resolution Optical Imaging (HROI), report the solution to a mechanical problem in microscope optics that was, in a way, of their own making. 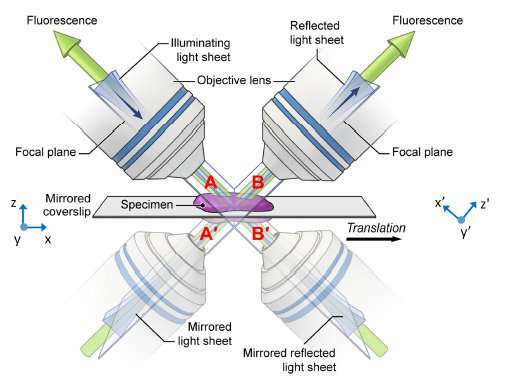 Several years ago, Shroff and colleagues developed a new type of microscope that performed “selective plane illumination microscopy” or SPIM. These microscopes use light sheets to illuminate only sections of specimens being examined, thereby doing less damage and better preserving the sample. In 2013, Shroff’s team created a SPIM microscope that used two lenses instead of one, which improved image quality and depth perception, In 2016, a third lens was added, allowing improved resolution and 3D-imagery. A fourth lens would have boosted matters even more, but at this point van Leeuwenhoek’s twenty-first century heirs hit a snag. Proximity was a real issue. 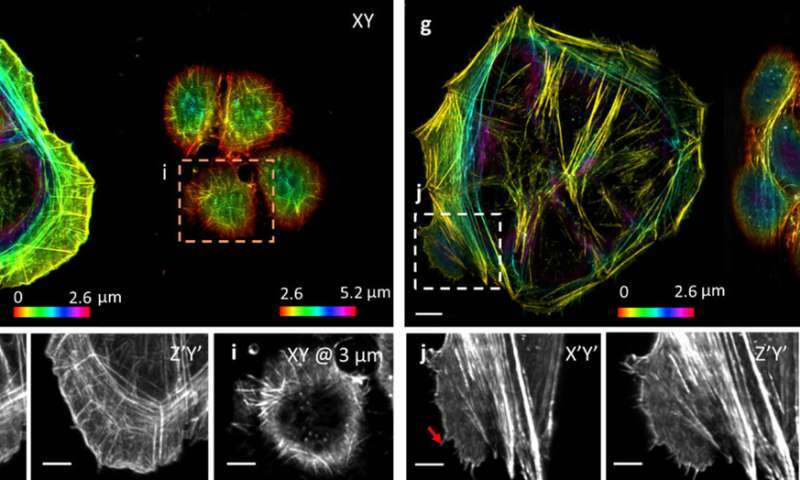 Not only were the three lenses crowded together, but all had to be positioned extremely close to the sample being examined to allow the imaging goal – detailed views of structures within a single cell, say – to be achieved. In their new paper, Shroff and his colleagues reveal a solution to the problem that is nothing if not elegant. Rather than try to cram an extra lens in, they have put mirrors on the coverslip – the thin piece of glass that sits on top of the sample. The result – especially when coupled with new algorithms in the computerised back-end of a SPIM microscope – is better speed, efficiency and resolution. “It’s a lot like looking into a mirror,” Shroff explains. “If you look at a scene in a mirror, you can view perspectives that are otherwise hidden. We used this same principle with the microscope. The addition of the tiny mirrors was not without its own problems. Every microscope raw image contains unwanted data from the source of illumination used to light up the sample. With three lenses, there are three sources of this interference; with mirrors added, these too are multiplied. Shroff, however, took this problem to computational imaging researcher Patrick La Riviere at the University of Chicago, who, with his team, was able to modify the processing software to eliminate the extra noise and further improve the signal. Francis Bacon, one thinks, would have approved.